Russia is claiming progress on a megawatt nuclear space propulsion engine. They had previously stated the system would be ready by 2017. 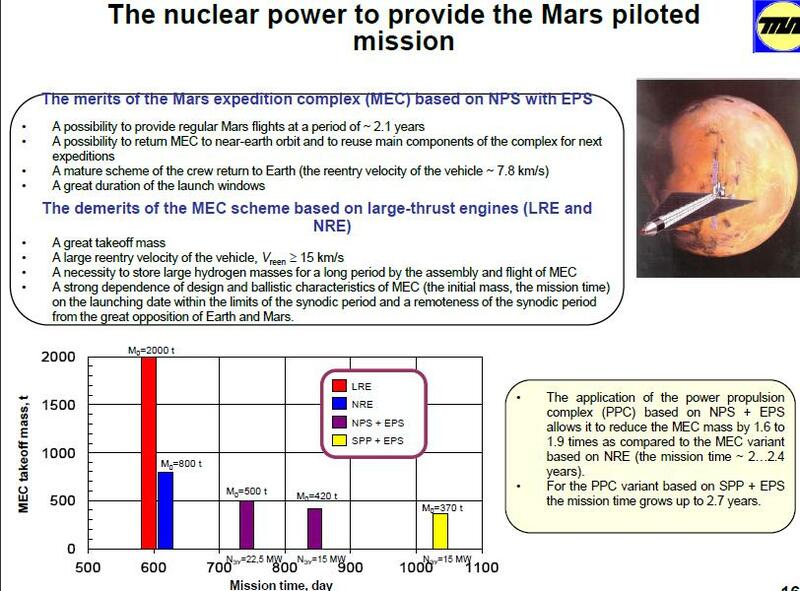 Ruscosmos is about a reusable gas-cooled fission reactor that powers a generator. This would power a plasma thruster. They have made some physical models and some video simulations. They claim to have made components and a drip heat radiator. 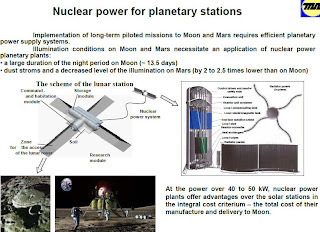 In 2016, Skolkovo Foundation’s Nuclear Cluster head Denis Kovalevich said Russia’s Megawatt-class nuclear propulsion system for long-range manned spacecraft must be ready by 2017. The engine is being developed for interplanetary manned spacecraft to ensure that Russia maintains a competitive edge in the space race, including the exploration of the Moon and Mars. The Russian government allocated 500 million rubles ($16.7 million) in 2010 to start a project to build a spacecraft with a nuclear engine. The overall investment in the project is estimated at 17 billion rubles (over $580 million) until 2019. 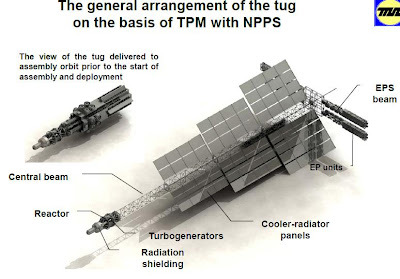 According to Russia’s nuclear power agency Rosatom, the development and construction of a nuclear propulsion system for spacecraft will cost over 7.2 billion rubles ($247 mln). 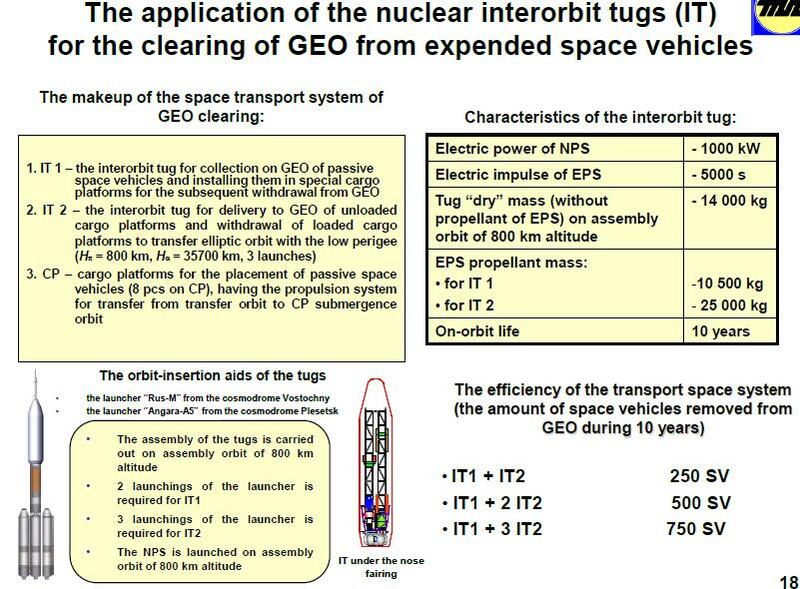 Nextbigfuture covered Russia’s plans for a megawatt nuclear space propulsion system back in 2011. It would have an ISP of 3000-6000. A 6000 ISP megawatt system might be able to send a compact unmanned probe to Mars in 6 weeks. The adjustable VASIMR system had planned for a manned 200 MW system with variable ISP which could get to Mars in 39 days. 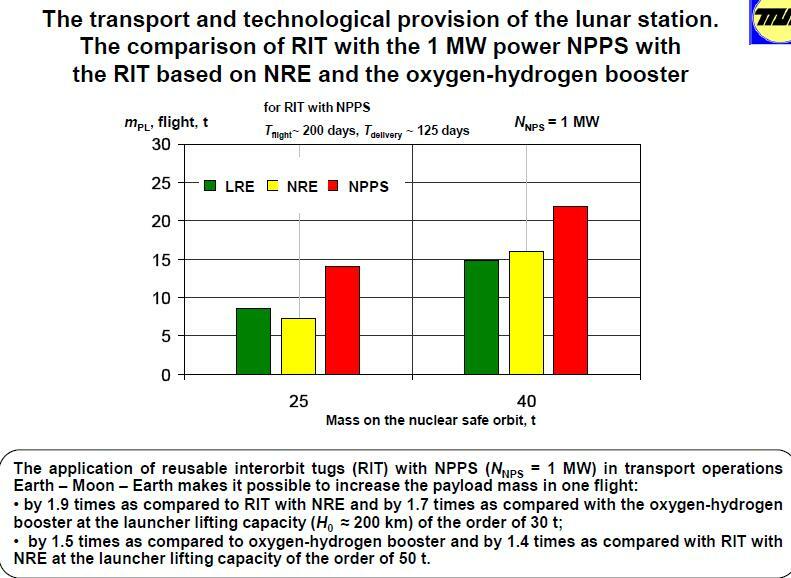 A presentation discussed nuclear power sources for space up to 1 megawatt for flying to Mars, moon base power and for orbital tugs. 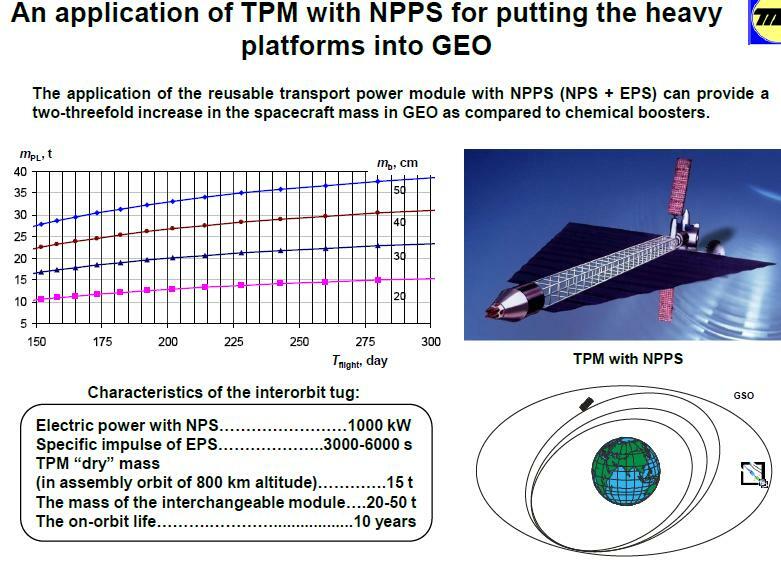 A qualitatively new stage in the development and practical application of atomic energy in space is linked with the use of multipurpose high-capacity propulsion-power modules. Their design based on a nuclear powered propulsion facility in the megawatt range has been approved and accepted for implementation. 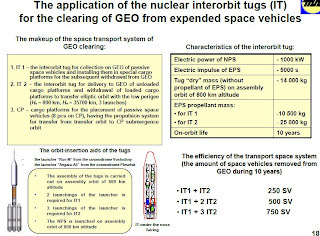 In this article, the facility is described, the principles of operation of the facility as a whole and its individual subsystems are examined, and the proposed characteristics and mass of the structural elements are presented. 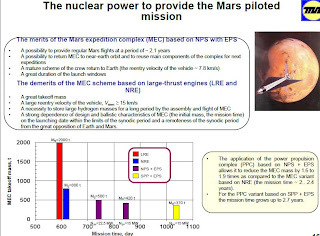 The advantages of using atomic energy in the power-plant–motor variant, including for manned flight to Mars, are shown. The new plan would be 4 years late on the design work and then 2 years late on the working prototype. 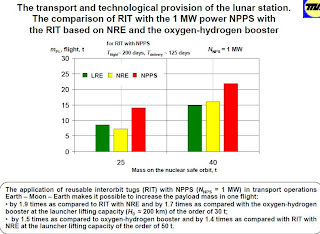 The results of calculations of the characteristics and development of a scheme and technical make-up of an open-cycle space power facility based on a high-temperature nuclear reactor for a nuclear rocket motor and a 20 MW Faraday MHD generator are presented. A heterogeneous channel-vessel IVG-1 reactor, which heated hydrogen to 3100 K, with the pressure at the exit from the reactor core up to 5 MPa, burn rate 5 kg/sec, and thermal power up to 220 MW is examined. 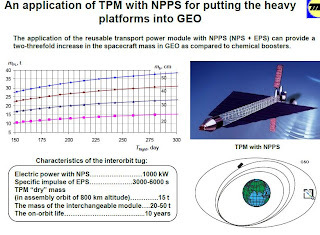 The main parameters of the MHD generator are determined: Cs seed fraction 20%, stopping pressure at the entrance 2 MPa, electric conductivity ≈ 30 S/m, Mach number ≈ 0.7, magnetic induction 6 T, electric power 20 MW, specific energy extraction ∼4 MJ/kg. The construction of the scheme of a MHD facility with zero-moment exhaust of the working body and its main characteristics are presented.